W hy do modern economies go through the “business cycle” of booms and busts? What caused the U.S. housing bubble that precipitated the financial crisis? Ron Paul vs. Paul Krugman is an examination of the root cause of the crisis as seen through the eyes of two prominent commentators on the subject, each representing a different school of economic thought. With relevant lessons for today, Ron Paul vs. Paul Krugman reveals how the fundamental cause of the the housing bubble that precipitated the 2008 financial crisis was the Federal Reserve’s inflationary monetary policy. 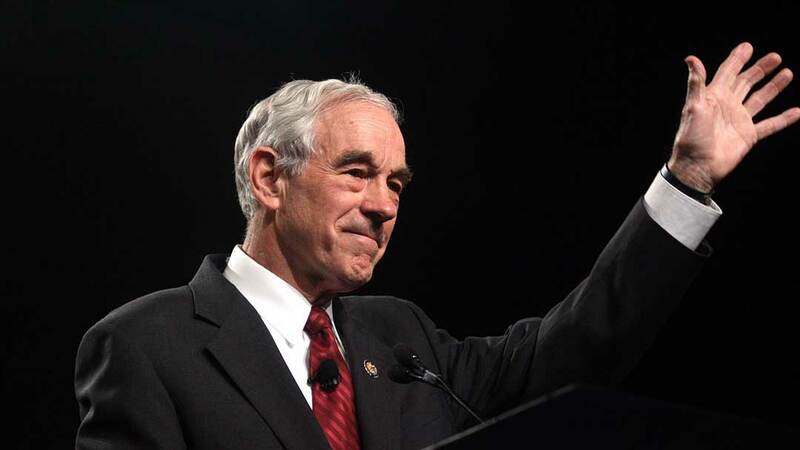 Congressman and presidential candidate Ron Paul has been perhaps the most visible proponent of the Austrian school, whose luminaries include Ludwig von Mises and Nobel Prize-winning economist Friedrich A. Hayek. Nobel Prize-winning economist and New York Times columnist Paul Krugman is a very well-known voice for the Keynesian school, whose adherents espouse the theories of British economist John Maynard Keynes. A comparative analysis of these two schools of economic thought as applied to the financial crisis and as promulgated through the views of Ron Paul and Paul Krugman is instructive. Whose school offered more explanatory and predictive power? Whose diagnosis and prescriptions have been better suited to deal with the problem? Which economic advice should we listen to now? Hey there! 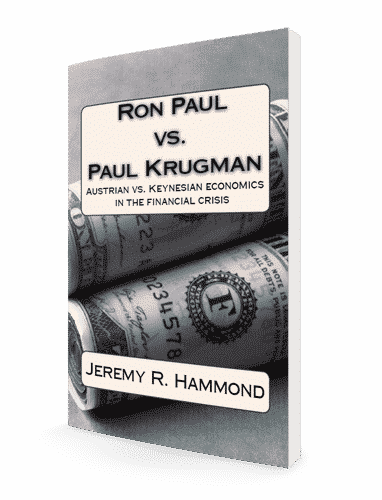 I’m Jeremy R. Hammond, the author of the book Ron Paul vs. Paul Krugman. The 2008 financial crisis negatively impacted all of us, in one way or another. It was precipitated by the bursting of the housing bubble. So what caused the bubble? Today, a full decade later, we are still being told that the US economy is “recovering”! But why has recovery taken so long? And is it really even a recovery, or are we just seeing another bubble that’s going to inevitably burst just like the last one? To know the future, we need to understand the present, and to understand the present, we need to understand the past. So why did the housing bubble occur, why was the “Great Recession” that followed so great, and why is the Federal Reserve still keeping interest rates so low (below 2% as I write this in summer 2018)? The importance of understanding the answer to these questions cannot be overstated. A huge number of Americans had their wealth wiped out as a result of the bubble bursting. A huge number lost their jobs. Our societal standard of living is less today than it would have been had economic growth continued along a sustainable path. If we want to protect our wealth and also try to change things to prevent economic disasters like this from happening again, we need to understand the bubble’s root causes. A popular view of the crisis is that it was caused by an over-exuberant free market. Due to a lack of government regulation, the market went wild, driven purely by greed and a thirst for immediate profits, without regard for the long-term consequences. The problem with this view is that it bears no relationship with reality. The truth is that the Federal Reserve system itself was the fundamental cause of the crisis, and that it was the perverse incentives created by Fed policy and the government’s policy of encouraging homeownership that caused the bubble. The government has an interest in concealing this truth from the public. After all, naturally, politicians are reluctant to acknowledge their own mistakes, and, after all, the Fed is a government-legislated private monopoly over the supply of currency. And by keeping interest rates lower than they otherwise would be, the Fed helps to finance exuberant government spending by keeping its debt repayments lower. Essentially, the Federal Reserve system exists to serve the interests of the politically and financially elite at the expense of the rest of society. The mainstream media in the US, for their part, also largely serve the interests of the politically and financially elite. They do so by manipulating public opinion with deceptive reporting that conceals reality, keeping us essentially enslaved to the ruling class. They serve the function of manufacturing consent for government policies by convincing us that those policies are good for us when in fact they are very much contrary to our own interests, robbing us of our wealth and threatening our liberty. To free ourselves and ensure the prosperity of future generations of humanity, we must understand what’s really been going on with the economy. We need to understand the causes of the modern business cycle. Unfortunately, mainstream economists do a miserable job of explaining it. They throw a lot of technical gibberish at us that only serves to obfuscate reality. They are essentially technocrats whose role is to manufacture public consent for the existence of central banking. Fortunately, you don’t need to have a degree in economics to understand why the housing bubble occurred. In fact, if you haven’t formally studied the subject, you’re probably at an advantage because you won’t have to “unlearn what you have learned”, as Yoda says! Which should we believe, indeed! There’s a simple way to determine the answer to that very important question. All we have to do is compare what mainstream economists were saying with what dissenting free market economists were saying and, with the benefit of hindsight, observe whose diagnoses and prescriptions proved more accurate. The mainstream view is that the fundamental problem is the recession. The recession is the disease that requires treatment with lower interest rates to incentive people to borrow and spend more. In this view, it is this spending that will get the economy back on track again. The free market view is that the recession is the cure for the disease, which is the unsustainable, illusory “growth” that occurs during the bubble years. In this view, it is not spending per se that creates economic growth, but wise capital investment. The problem is that, in order to know where to direct scarce resources, investors and entrepreneurs rely in the signal of market prices. 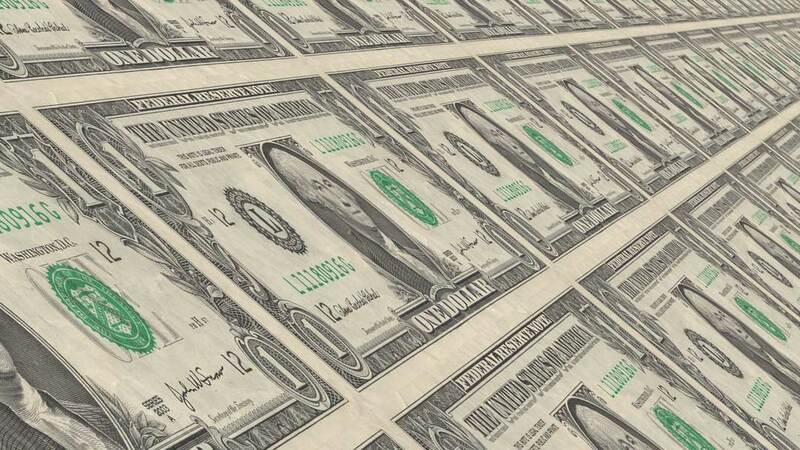 By artificially maintaining interest rates below where they would otherwise be, the Fed distorts these pricing signals, resulting in malinvestment and unsustainable debt creation. 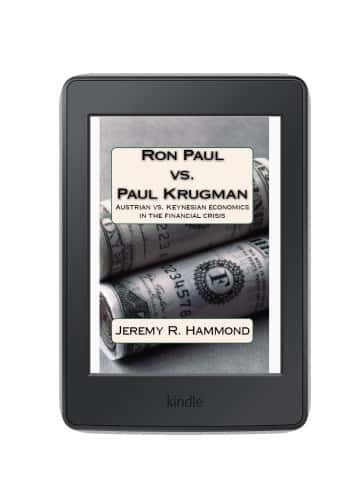 In my book Ron Paul vs. Paul Krugman, I approach this question by examining the diagnoses and prescriptions of two prominent figures, each representing a drastically different economic school of thought. I decided to write this book in 2012, during the run-up to the presidential election. Ron Paul was a candidate, and so his economic views were frequently a topic for discussion. I remember going on Facebook and seeing a lot of people dismissing Dr. Paul as a crank — even though he had long in advance warned about the housing bubble. I would also see people praising Nobel-Prize-winning economist and New York Time columnist Paul Krugman as someone policymakers should listen to in order to fix the economy — even though he had long advocated that the Fed push interest rates down specifically to fuel borrowing and spending in the housing sector! So, to set the record straight, I set out to examine more closely the views of these two prominent figures. Ron Paul represented the views of the Austrian school of economics, whose luminaries include Ludwig von Mises, Nobel-Prize-winning economist Friedrich Hayek, and Murray N. Rothbard. Paul Krugman represents the mainstream economic profession and Keynesian school of economics, which is based on the economic theories of British economist John Maynard Keynes. 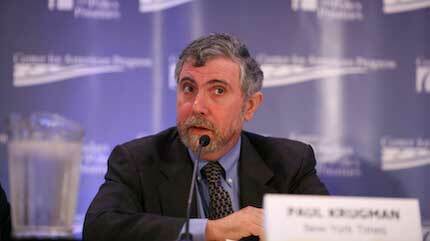 Ron Paul vs. Paul Krugman gives you a simple timeline of who said what and when. Whose warnings were accurate? Whose predictions came true? Whose views remained consistent, and whose changed over time and became self-contradictory? The answer to the important question of what fundamentally caused the housing bubble is right in front of us. My book will help you see through the technical gibberish mainstream economists use to keep you in the dark and subservient to a system that robs you of your wealth in order for the rich to get richer. It’s a fairly short and easy read, but its packed with insights into how the economy actually functions. This book will empower you with the knowledge you need to protect your wealth. Like Ron Paul, you will gain the foresight to know what’s coming, enabling you to act accordingly and base your decisions on economic reality rather than the crude propaganda narrative we’re constantly inundated with. It will empower you with the confidence to help affect change by speaking out and sharing this knowledge with those around you. Together, we can create a brighter, more prosperous future for our ourselves, our children, and future generations of humanity. We owe it to our children to do everything in our power to ensure they live in a world that is better than the world we are living in today. Empower yourself with this knowledge by purchasing your copy of Ron Paul vs. Paul Krugman today! It’s available in paperback, PDF, and Kindle editions, and it’s yours for just a few Federal Reserve Notes, which unfortunately, thanks to the existing enslaving system, I am forced to use to make purchases to provide for my family! But, together, we can change that. Join the revolution. Learn why it is so important for us as a society to “End the Fed”! It’s time to take control over our lives out of the hands of the technocrats and bureaucrats who attempt to manipulate our behavior by centrally planning the economy. It’s time to put the control over our lives back into our own hands. It’s time to allow liberty in the marketplace so that voluntary exchange for mutual benefit can occur, rather than our wealth being stealthily and fraudulently robbed from us. What Others Have to Say about Ron Paul vs. Paul Krugman. Any work of economics that can make you laugh is at least worth a look. If in less than 100 pages it also informs you about a subject of great importance, it might just qualify as a must-read. Jeremy Hammond, a political journalist self-taught in economics and a writer of rare skill, has produced such a book…. Learned about this book thru the podcast you did with Mance. Couldn't put it down once I started it. I really like this book! I commend the author for his clear perspective…. I find the book quite accessible. You don’t need a background in economics or finance to follow the book…. If, like me, you believe that our monetary and financial system is a house of cards, then this book might guide you to ask the right questions. I believe this issue is the most important thing for each of us to tackle today. More important than terrorism, immigration or health care. Are you disturbed by the fact that you’ve worked hard and diligently saved your money, but now your savings account yields less than 1% interest? Are you curious as to which economists think punishing savers is a good idea? … There’s no bias here. It is crucial to note that this book discusses economic theory. This is not a “Republican vs. Democrat” issue! … This book is about acknowledging the fact that economics is a behavioral science…. Truly excellent work by Mr.Hammond. I don’t know of any other source for such a comprehensive comparison of what these two leaders had to say about monetary policy and the housing bust. Two thumbs up! Cogent, passionate, clear, informed. Also quite readable. A must for those interested in economics. Jeremy Hammond will be an auther to watch. Got it just in time to finish it before the CNBC debate between Ron Paul and Paul Krugman. As good as the debate was, the book is even better. One comes away reading this book with little or no doubt as to who’s been right and who’s been wrong. The method the author uses for this is very difficult to take issue with. It’s basically a timeline of who said what when (based on public record), whether they stayed consistent, or whether they backtracked or contradicted themselves after the fact…. I highly recommend it. This small book demolishes Krugman. It shows how wrong he and the Keynesians were about the Housing bubble and how right Ron Paul and the Austrians were…. Krugman still can’t admit he was wrong for supporting the Fed policy that helped create the housing bubble…. Krugman just can’t believe that there is a limit on how much you can inflate the economy without having to pay the consequences. Outstanding book. I have never read a more convincing argument in my life. A must read if you want to understand the world’s fiscal woes. Get the Paperback + Free PDF Along With All My Books for One Low Price! 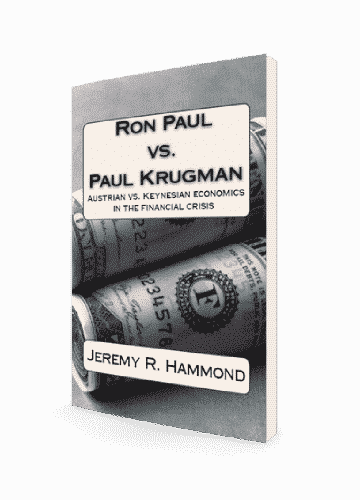 Prefer to Buy Ron Paul vs. Paul Krugman Individually?